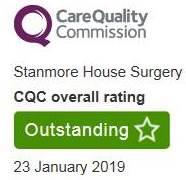 At Stanmore House Surgery, the doctors and staff are committed to offering the highest standard of patient-centred healthcare. We aim to treat all our patients promptly, courteously and in complete confidence. We have excellent General Practitioners who offer a full general practice service. We run many clinics for the management of chronic diseases such as asthma and diabetes and offer a wide variety of other medical services postnatal care, minor surgery, childhood vaccinations and well-person check-ups. Stanmore House Surgery is committed to continued medical education. We are a training practice for qualified doctors who wish to specialise in general practice. We also teach medical students from Birmingham University. The teaching is often clinic based and patient involvement is encouraged. Patient consent is always obtained prior to consultations. The practice and on-site pharmacy are accessible to patients with mobility problems. A designated parking space is available for Blue Badge holders. We hope you will use this website as a resource to obtain information about our practice, the staff and the services we provide. Please have a look around and send us some feedback. In addition to the practice’s normal opening hours, you can also book an appointment on a Tuesday evening after 18:30 hrs. These appointments are pre-bookable by contacting the surgery during usual opening hours. When calling, please ask for an Improved Access appointment. You can now also book an Improved Access appointment after 6:30 pm Monday to Friday evenings, or Saturday and Sunday mornings at locations across the Wyre Forest. GP practices in the Wyre Forest are working together to provide Improved Access appointments to patients. Please note you may be seen at Hume Street Medical Centre by a different GP from another practice. When parking in the street please give consideration to our neighbours and do not block driveways. Want to get more active, explore what's on your doorstep and make new friends? Join Stanmore House Strollers (click for video). "This gentle walking has improved my health, I have made new friends and it is fun!" "Great for friendships and I can walk further for longer"
"Encourages me to do more walking"
"Meeting new people and trying to lose weight"